Please read Joyce's story below and help, if you can, her niece Chelsea and girls like her who suffer from Rett Syndrome, a rare disease affecting little girls all over the world. On May 18th 2013, Nienke, Jetteke, Anneloes, Jolanda, Judith, Saskia, Peronne and Joyce, all Dutch expats in Singapore, will be running the full, half and quarter marathon on the Great Wall of China. A physical challenge for all of us. We started training together in August last year, just for fun, because we wanted to enter the Run for Hope (3,5 or 10 km) in November. Some of us had never ran before, most of us had a little or more experience. During training we discovered not only that running was good exercise, it also was 'gezellig' (that weird Dutch word for ‘fun’) to train together. To give us goal to run for, we decided to go to Beijing for the Great Wall marathon. We did not exactly know what we were getting ourselves into. The Great Wall Run does not only mean running a long distance, it also means climbing approximately 2600 steps. For Anneloes, the only one who is doing the full marathon, it means climbing almost 5200 steps! This means we need two kinds of training: Running and climbing steps. 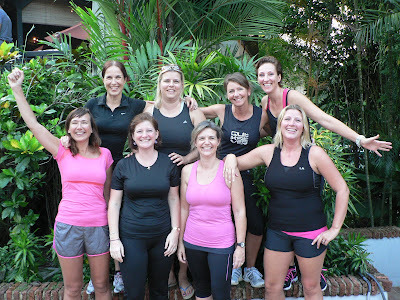 On Monday nights we run in the Botanic Gardens, and on Friday mornings we practice climbing steps. We go to Kent Ridge Park, Bukit Timah Nature Reserve, Labrador Park, Mount Faber Park, or just go to a high building to run up the staircase. Is that fun? Not always, it is hard work and it can be boring. But putting on some music whilst working out, doing it together with friends, and having a goal to work towards really helps. Your body needs quite a lot of training to get used to running long distances, and if you keep going and build it up carefully, you will find you can do so much more than you thought. Next to the physical challenge, our run has a purpose attached to it: we intend to raise a vast amount of money for little girls with Rett Syndrome. Joyce's niece, Chelsea (16 years old), suffers from Rett Syndrome and is pictured below. Rett Syndrome is a rare but devastating neurological syndrome that strikes at random in early childhood, primarily affecting girls. The symptoms of Rett are severe, including autism, cerebral palsy, Parkinson's, epilepsy and anxiety disorders... all that in one little girl. Rett Syndrome Research Trust (RSRT) funds research to find a cure for Rett. Amazing results have been achieved already. Rett syndrome has been proven reversible in the lab. Funding research for Rett will also provide us with invaluable information about more common disorders like autism, Alzheimer's, Parkinson's, schizophrenia and multiple sclerosis, which could be helping millions of sufferers all over the world. All funds raised by us go directly to RSRT, as the running team covers it’s own expenses. And we need your support! We are proud that Nike will sponsor our shirts, and that we have found companies that are supporting us (like Flow traders, Finder Financials, Van Oordt, and more to follow). The Chinese press is being contacted to cover this run for promotion and awareness campaigns on Rett Syndrome. If you would like to donate to our cause, please visit our firstgiving page to make your contribution. Alternatively, you can donate the money on RSRT’s website https://secure.rsrt.org by referring to ‘China marathon’ under the heading ‘dedication’. Please note that payments can be made in US dollars only.